If you have any safeguarding concerns about your child, or another child in the school, please speak to one of our safeguarding leads. Talking about internet safety with your child. 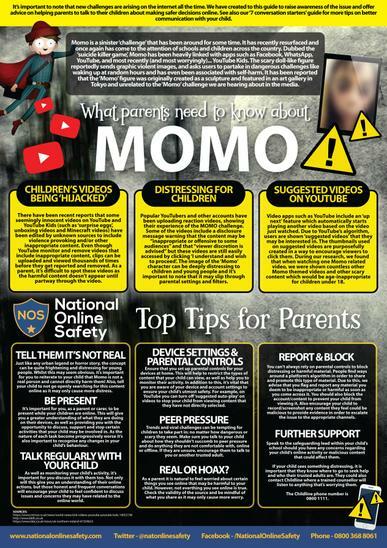 Check out the poster "what parents need to know about MOMO". Please take a look at the age rating guide for parents. 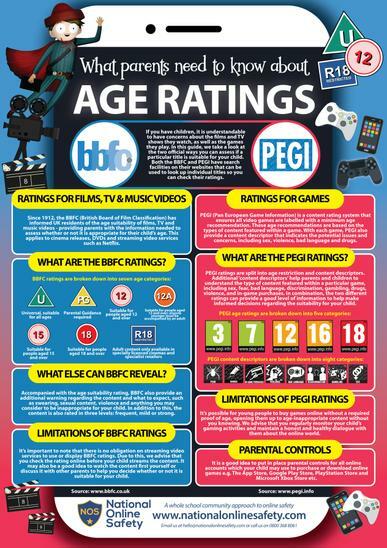 This poster shows film and game age ratings. Monday morning we welcomed Aaron Phipps to our school. What an inspirational person. 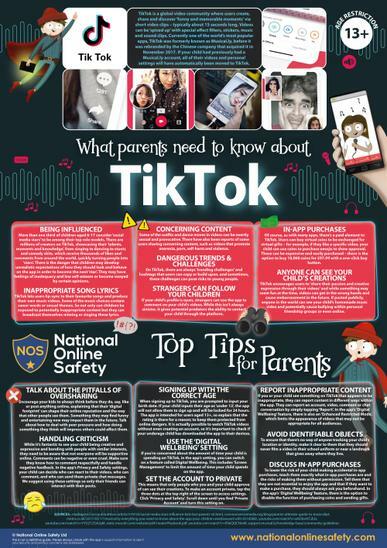 Please check out the poster below about TikTok. 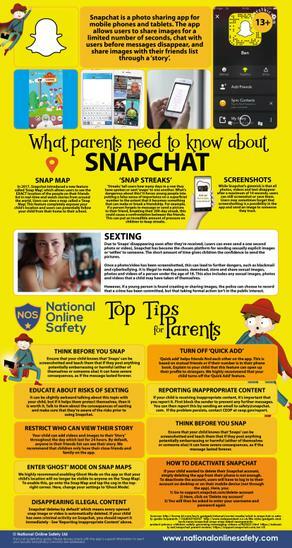 Please view this video for parents from National Safety Online. It is a song about digit gifts and staying safe online. Enjoy! Check out google internet legends - the website has a section for parents and a game to play with your child relating to internet safety. We are now coming into the Norovirus ‘winter bug’ season and therefore the attached guidance will support your school in reducing the risks and potential spread of infection. Health Advice Guide can be found below. Please be reminded that children who have Norovirus symptoms must remain off school or nursery for48 hours after the last episode of vomiting or diarrhoea to stop the spread of the infection to other children and staff. Our assembly theme this week is 'Road Safety'. During this week it would be great if you could also discuss road safety with your child/children. We also take this opportunity to remind all car users of considerate and safe parking. Anti-bullying week starts with odd socks day on Monday 12th November. Keep a look out on twitter to see what the children have been up to. Take a look at our new safeguarding board for parents. We look forward to a visit from Sapphire, who will be speaking our KS2 children about mental health, online safety and cyber bullying. Sapphire will be replacing the missed visit from Danny Boyle, who is unfortunately still unwell. During our safeguarding week all children will be exploring a different area each day. The week will include a working with the NSPCC and a visit from the PCSO's . Our new Lockdown policy was sent home in our Emergency procedure booklet- please ensure you know about what is required of parents in the event of a lockdown. Safety is of a huge priority - Visitors from the Health and Saftey team came to assess the school and ensure it is "fire safe". A report will be created and shared and actions completed. Click here to access more information and resources..
LAURA LANGHORN - Emotional Well-being practitioner. Monday 5th Feb, we have started the week with an assembly outlining what Children's Mental health week is all about. If you want to know more, the powerpoint used has been attached below. Week Beginning 29th Jan - Our new Well-being display is going up in the hall ready for "Child mental health week" next week. Next week we will be celebrating "Our uniqueness"
Our 3rd member of staff is completing their "Reach and Rescue" training provided by the swimming service to ensure they are fully compliant in supervising swimming sessions.